Yoga is considered to be the most ancient spiritual practice of health and science that is originated in the lands of India. It has emerged as one of the holistic and unique disciplines of health practice that can be used as both preventive and curative measures. Yoga has been proved to be harmonizing the physical body, spirit, and mind. It has promoted an overall sense of well-being and peace. There are many schools in the world where programs for teacher training are being provided. Yoga teacher training programs in Rishikesh Yog Mandir. Individuals can obtain certification after the completion of yoga training. Being the most reputed yoga schools in India, it has best yoga teachers who have a great deal of experience in this field for many years. Rishikesh Yog Mandir offers 200 hour yoga teacher training in Dharamsala that not only provides in-depth and profound knowledge of this ancient form of health and spiritual practice along with its branches but also assist in analyzing the different conventional texts. The 200 hour yoga teacher training in Dharamsala India is designed with the intention of developing the exact form and skills of Yoga practice. This helps in gaining more hold on the postures and increasing strength and agility in the body. Further, these courses help in learning the most basic concepts of yoga asanas which is necessary for effective practice. The 200 hour yoga teacher training in Dharamsala India that Rishikesh Yog Mandir offers has the most basic learning of the asanas. This program is meant to be completed for beginners and intermediate yogis before going to the advanced level of yoga training. At Rishikesh Yog Mandir, there are experienced trainers who impart yoga training to the individuals interested in the program. There is the inclusion of the in-depth understanding and knowledge of 200 yoga courses in Dharamsala based on Hatha Yoga and its divisions which are Asana, Shatkriya, Mudra, Pranayam, Samadhi, and Bandha. Along with learning perfect asanas and postures, the yoga teacher training program that we offer also revolve around different styles of Chandra or Surya Namaskar, mantras for opening and closing asanas. Here, we have also devised the best 200 hour yoga ttc in Dharamsala with the inclusion of Pranayam structures such as Bhastrika, Kapalbhati, Mudras, Bandhas, Sheetali and many more. These aspects are included in the program by considering the individuals who have the desire of creating and a Yoga organization of their own and develop their skills. Rishikesh Yog Mandir is a yoga center in Dharamsala is reputed due to its high quality and one of the best yoga ttc in Dharamsala as we have internationally recognized and experienced trainers of Yoga who enable the individuals in recognizing and finding their voice to be an aspiring trainer. 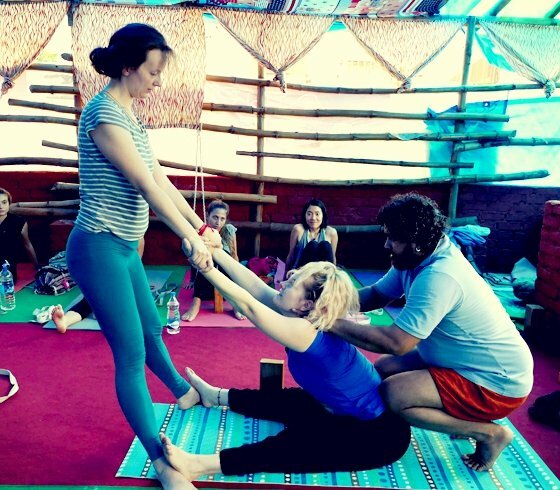 The 200 hour yoga teacher training India that we provide here are conducted in a very casual, dynamic and fun atmosphere that also include the Yogic convention. We ensure that all the individuals coming to us for getting trained in these courses are learning the skills in the best possible way.